The ANAR Foundation is a Spanish organization which helps kids in risk of abuse. They Operate a unique phone number – 116 111 – where minors at risk can get aid and consultation. 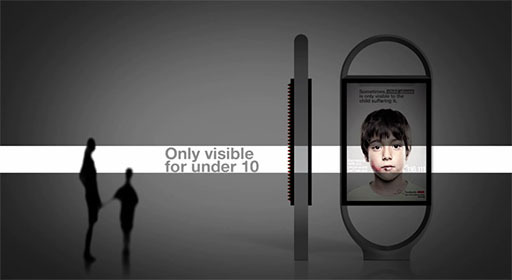 Anar did a campaign advertising the number, but they faced a potential problem: they didn’t want adults (i.e., possible aggressors) to see that a kid was even looking at the ad. So they came up with a nifty solution. They used Lenticular printing on street signs. 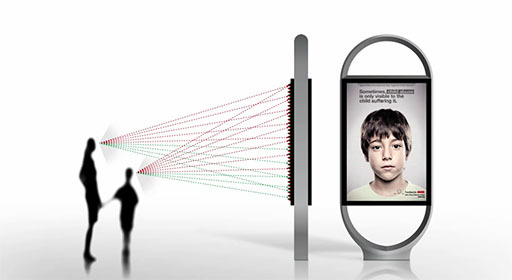 Lenticular printing is a technology in which Lenticular lenses (a technology that is also used for 3D displays) are used to produce printed images with an illusion of depth, or the ability to change or move as the image is viewed from different angles. The ad appears differently based on the height of the viewer. The bloody lip, and the phone number, is visible only to kids in a height range typical for a ten year old.